Worries about losing out at auctions may drive participants to pay over the odds, a brain imaging study shows. Websites such as eBay have fuelled the sale of goods through auctions, with some people becoming hooked. Brain scans of people taking part in an auction showed those "overbidding" had a greater response to losing than to winning, the Science journal reported. The US researchers said the findings went against the theory that paying too much is driven by the "joy of winning". In the first part of the research, 17 participants took part in either an auction game with a partner or a lottery game. Both involved winning money but in the auction game, the idea was to outbid your partner, whereas in the lottery game winning was simply down to chance. A type of scan called functional magnetic resonance imaging (fMRI) showed that in the auction game there was an exaggerated response to loss in the striatum - part of the brain associated with reward - but hardly any response to winning. The greater the tendency to overbid, the stronger the response to loss suggesting that the prospect of losing the competition caused participants to bid too high, the researchers said. In a separate study, the team from New York University provided three groups of participants with an auction game but with different circumstances. One group was asked just to make bids, one was told if they won the auction they would get a $15 bonus and the other was given a bonus up-front but told they would lose the $15 if they failed to win the auction. Although the outcomes were the same for all winners - an extra $15 - those in the "loss" group consistently bid higher than the others. Study leader Professor Liz Phelps said: "We thought we would see an exaggerated response when people won but we found the opposite. "In the study they didn't know which person they were bidding against so this was more like an eBay auction. 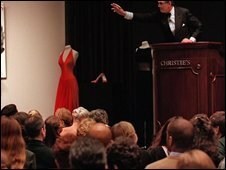 "The effects may be even more exaggerated in a sit-down auction," she said. Professor Nigel Nicholson, an expert in organisational behaviour at London Business School, said the results made a lot of sense as "loss aversion" is known to be a strong driver of human behaviour. "People hate to lose much more than they like to win." He added that these types of imaging studies were helping to boost understanding of decision-making, for example in the stock market.